Earlier this month, mosquito eradication efforts in South Carolina, gone horribly wrong, resulted in almost total devastation to the indigenous bee populations. The pesticide used to target the Aedes albopictus and Aedes aegypti species of mosquito, which can carry and transmit the Zika virus, killed off millions of bees. This single incident is one of many that have been laying waste to beneficial pollinators which has now led to the bumblebee’s proposed listing as an endangered species. The U.S. Fish and Wildlife Service on Wednesday proposed listing the rusty patched bumblebee, a prized but vanishing pollinator once widely found in the upper Midwest and Northeastern United States, for federal protection as an endangered species, according to Reuters. 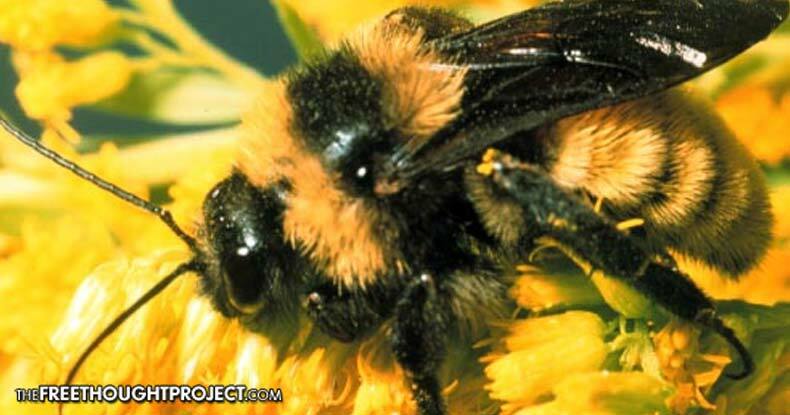 The Bumblebee is one of several wild bee species seen declining in the last couple of decades. It has now become the first ever bee in the continental United States formally proposed for listing under the U.S. Endangered Species Act. Bumblebees, as distinguished from domesticated honey bees, are essential pollinators of wildflowers and about a third of U.S. crops, from blueberries to tomatoes, said Sarina Jepsen of the Xerces Society for Invertebrate Conservation, which petitioned the government for protection of the insect, as reported by Reuters. According to experts, bumblebees’ contribution to farms is estimated at a whopping $3.5 billion. The rusty patched species is one of 47 varieties of native bumblebees in the United States and Canada, more than a quarter of which face a risk of extinction, according to the International Union for the Conservation of Nature. Population declines among wild bees are much more difficult to document than those in honey bees, which are for the most part managed commercially and whose numbers are carefully tracked by beekeepers, Jespen said, as reported by Reuters. According to Reuters, Jepsen said protections proposed for the rusty patched bumblebee will intensify the debate over the degree to which so-called neonicotinoid pesticides, routinely used in agriculture and applied to plants and trees in gardens and parks, have contributed to the decline of native bees. While there is still debate over neonicotinoid pesticides, the only one not recognizing their harm — is the industry that uses them. Other insects are devastated by neonics, including the North American bumblebee which has seen a 90 percent decline. The threat to wild bees, honey bees and other pollinators is becoming ever more clear as more studies come out. The findings of the Centre for Ecology and Hydrology team appear in the journal Nature. “Endangered Species Act safeguards are now the only way the bumble bee would have a fighting chance for survival,” Jepsen added. According to the Fish and Wildlife Service, the public comment period initiated by Wednesday’s proposed listing runs through Nov. 21, 2016, after which the agency could revise its proposal or finalize a decision.